World Series of Fighting welterweight champion Steve Carl, Los Ben Dejos, Leva, MVP and PWF promoter join The Roman Show March 5. After defeating Josh Burkman at the World Series of Fighting in South Florida back in October, Steve Carl gets to make his first welterweight title defense against the controversial fighter Rosimar Palhares this month. Carl will join The Roman Show Wednesday, March 5, at 9 p.m. ET. He meets Palhares March 29 in Las Vegas, NV. live on NBC Sports live starting at 9 p.m. ET. The World Series of Fighting just signed Palhares and will be making his debut for the Las Vegas promotion. 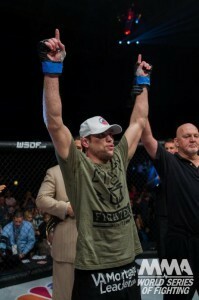 He joins WSOF after being released by the Ultimate Fighting Championships. Also on the show, one half of the first ever tag team champions of SHINE wrestling Leva will join us to discuss about their recent victory, who they will defend it against and how they felt about winning. Pro Wrestling Federation will be hosting their first show in Broward County March 8. The promotion’s promoter Joseph Cabibbo will call in to let us know about the big show featuring Luke Hawx and other well-known professional wrestlers. Indy tag team sensations Los Ben dejos will be in action at CWF Maximum Force May 15 in Miami, Fl. They explain about their competition and what fans can expect. Lastly, TNA Impact Wrestling’s MVP will join us on The Roman Show talking about becoming the company’s mystery investor and about his three-on-three tag match at TNA Lockdown at the BankUnited Center in Coral Gables. Plus, find out how to win free tickets to the big show airing on pay-per-view. Tickets are on sale. He also addresses his career, watching wrestling growing up and rapping with Miami rappers Pitbull and Rick Ross. Hear it live at 9 p.m. ET.